Has anyone found out how to rid IE of the "Curse of qvo6"? For some time now, whenever I call up a new copy of IE10 I get a spurious Web Browser. which is a low grade search engine. I never asked for it. I don't want it. I just can't get rid of it. Has anyone come up with a way to purge my machine of this vice? I have asked similar questions at other forums and received advice which I have followed. Unfortunately, up to now, no-one has come up with a cure THAT ACTUALLY WORKS! If you have one, I (and probably thousands of others) would dearly love to know what it is. (1) Go to Control Panel\Programs\Programs and Features and uninstall the any utility related to the hijacked and redirected URL. Then open your browser and go to tools---->manage addons----> in tools bars and extensions remove/disable anything related to the hijacked and redirected URL. (1) I have done all these things before and I just did them again. (2) I tried all of those and the only change is that one of them has tried to install Ask.com as my default search engine. Other than that no progress! It was the second of them. There was a dialog which gave the option of installing Ask and making it default. I carefully declined but I got it anyway. It is worse that qvo6 in that if I click for another page of IE10 (the grey box up at the top of the screen next to the current screen title) it comes up with Ask. At least qvo6 only comes up in a new copy of IE10. Neither of these are accessible through Control Panel -> ->Uninstall. IE10 is set to have Google.com as default. These two just overwrite that. Kaspersky doesn't see it. MalwareBytes can't find it. Lawrence Abrams, the Bleepingcomputer.com site owner and myself have replied. The plot with qvo6 thickens - curdles or coagulates perhaps. Now the interface comes up as a pretent Google.com interface. This darn thing has updated itself! This actually worked - thanks! 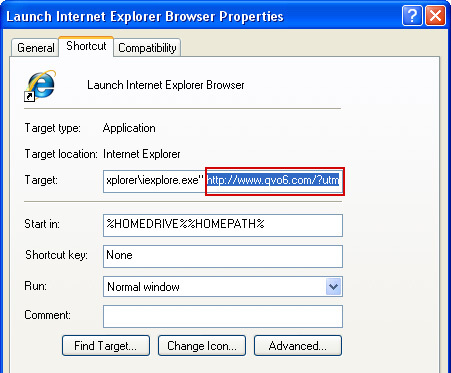 Although I didn't have a IE shortcut on my desktop, I right clicked on the explorer icon in the start menu and selected properties and deleted the string as per above. All seems back to normal again... Yay!